Marcel Dionne is a retired Canadian professional ice hockey centre who played 18 seasons in the National Hockey League for the Detroit Red Wings, Los Angeles Kings and New York Rangers. Marcel Dionne was inducted into the Hockey Hall of Fame in 1992. He was also the last active player in the NHL that participated in the 1972 Summit Series. Despite not playing in the 1972 Summit Series, he did play for Team Canada in the 1976 Canada Cup and the 1981 Canada Cup. For the 1976 Canada Cup, his linesmates were Bobby Hull and Phil Esposito. Dionne also won a bronze medal in the 1978, 1983 and 1986 World Ice Hockey Championships. In the 1978 edition, he was named the top forward. 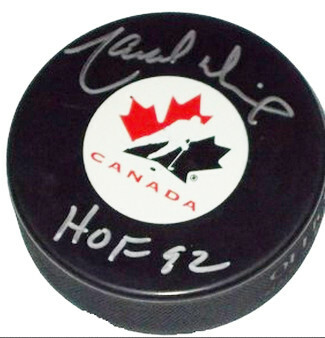 Marcel Dionne has hand signed this Canada Logo Hockey Puck with HOF 92 inscription. MAB Hologram and Certificate of Authenticity from Athlon Sports.